The 2013 Mount Rushmore National Memorial Quarter is offered by the United States Mint as the last of five 2013-dated strikes of the America the Beautiful Quarters® Program. Located on the reverse of the quarter is a design emblematic of Mount Rushmore National Memorial located in the state of South Dakota. Aside from being the fifth quarter issued during the year, the Mount Rushmore coin is also the twentieth in the program overall. A total of fifty-six will be issued before the series is completed in 2021. The same designs featured on coins of this series are also featured on two other US Mint programs - the America the Beautiful Silver Bullion Coins™ and the America the Beautiful Five Ounce Silver Uncirculated Coins™. Unlike the quarters, these two other series are each struck from five ounces of .999 fine silver to a diameter of three inches. The America the Beautiful Bullion Coins are struck for investors and sold through the Mint's network of authorized purchasers. The five ounce uncirculated coins are struck for collectors as the numismatic versions of the bullion coins and are initially sold directly to the public by the United States Mint. Mount Rushmore National Memorial of South Dakota honors four past Presidents of the United States with sixty-foot likenesses of their faces. Those four presidents are George Washington, Thomas Jefferson, Abraham Lincoln and Theodore Roosevelt. A portrait of the first President of the United States, George Washington, is shown on the obverse of all America the Beautiful coins and was designed by John Flanagan. Obverse inscriptions include UNITED STATES OF AMERICA, QUARTER DOLLAR, LIBERTY, IN GOD WE TRUST and the mintmark. 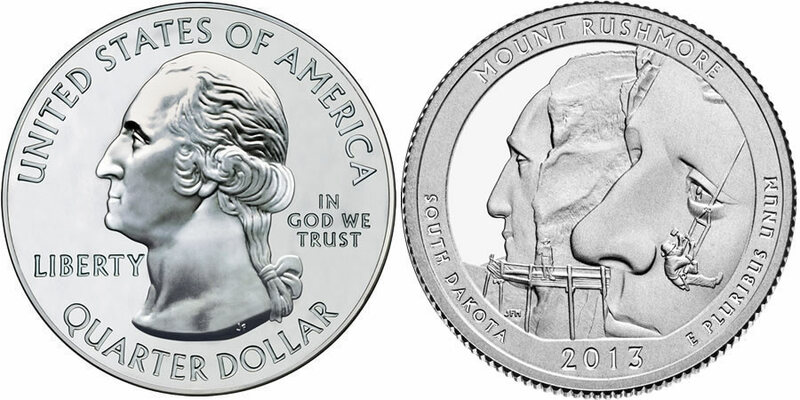 A design emblematic of Mount Rushmore National Memorial of South Dakota is located on the reverse of the coin. Reverse inscriptions include MOUNT RUSHMORE, SOUTH DAKOTA, 2013 and E PLURIBUS UNUM.